It is well known that routine stretching can help increase flexibility, prevent injury, and relieve muscle soreness. The Total Gym is a perfect piece of equipment to incorporate into your stretching routine because of its added versatility and resistance, and is able to provide a deeper stretch. 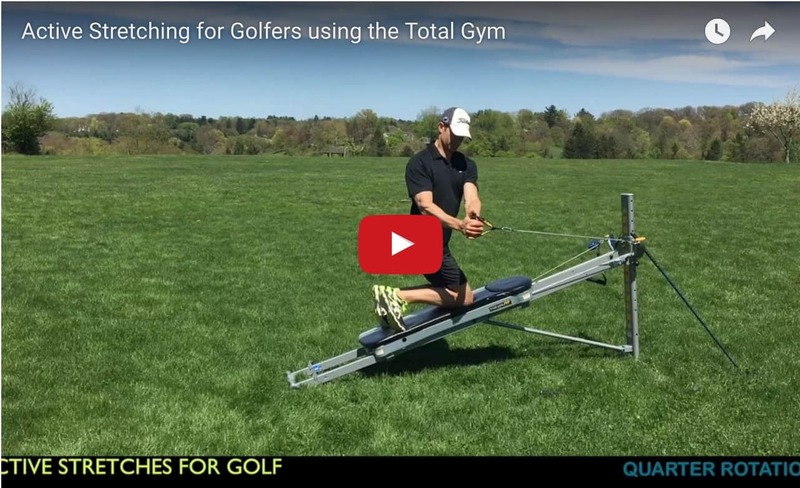 If you are a golfer, the Total Gym can be used as a functional tool, not only to provide the benefits of stretching, but also to improve your swing technique and overall game. The following provides some examples of active stretches for golfers that target the back, shoulders, and legs utilizing the Total Gym. One of the most commonly known stretches is the hamstring stretch. Traditionally, this stretch is performed by reaching down toward your toes from a standing or seated position. If you have lower back pain or soreness, this stretch must be performed very carefully or you can actually put more stress on your back. Using the Total Gym to perform this stretch is more safe and effective than the traditional method. The stretch starts from a seated position on the glide board. Grab the handles while facing the tower, then bring your legs onto the glide board keeping them straight with your feet flexed (pointed up to the sky). While seated upright with your chest lifted, begin to roll down one vertebrae at a time starting from your tailbone. Be sure to support your back by keeping your abdominals active through this movement. After several seconds of holding the stretch, reverse the movement, returning back to the starting position. Starting from a low kneeling position on the glide board facing the tower, slowly lower your chest down and reach your arms toward the tower. This stretch targets your lower back, which is an area vulnerable to injury in golf. 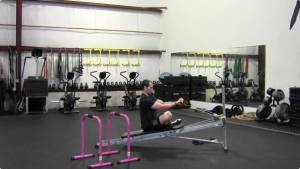 One of the techniques I like to add with this stretch is to pull my arms down while raising my chest into a surfer row. This surfer row articulation will help strengthen the lower back by offering the dual benefit of contracting the back muscle just after performing the lengthening stretch. It’s a win-win strategy to loosen and strengthen your back for golf! Next, there are stretches you can do that are specific to the golf swing. Golf can be a complicated game that takes many hours of practice just to learn the different swing mechanics. Using the Total Gym can simplify the swing to its most basic movements, so practicing these movements can help improve your fundamental swing. The results from this type of training can be extremely effective and the game can be a lot of fun! First, you need to have good posture to start the golf swing. From a kneeling position on the Total Gym, grab one handle with both hands in front of you. You should feel your shoulders being pulled back, chest pushed out, and your back straight and not rounded. The resistance (pull) provided from the Total Gym helps put you into the correct golf position. In almost all cases, your backswing begins with your shoulders and arms moving together in one piece. A good way to practice this is to swing in short quarter turns. The Total Gym is very useful to help with practicing this movement. From your kneeling position, just turn your arms and shoulders just enough to make a quarter turn back. You should feel your shoulders turn and your arm stretched to your side. Your chest should remain facing your hands while you turn. The quarter turn stretch can be performed in both directions. Moving from the quarter turn to a full swing takes a strong shoulder turn and a lot of core rotation. During your swing, you know your shoulders are turning correctly when your left shoulder (for a right handed golfer) is under your chin at the peak of your backswing. You can work on this using the Total Gym! Start with either a seated position (easy), kneeling position (intermediate), or standing position (difficult) facing perpendicular to the glide board. With both arms, grab the far handle that is most behind you. Then practice your full swing rotation, keeping your arms extended and your chest facing your handle/hands throughout the entire motion. This full swing motion will allow you to stretch and strengthen the primary muscles that generate the most club head speed in your swing. It is an excellent stretch and a great tool to ensure you are getting the most from your swing. The movement can be done on either side of the Total Gym so your backswing and downswing can be trained. We are going to finish off these stretches with a quick and effective hamstring stretch and hip flexor stretch combination. Start by standing at the base of the Total Gym with the pulley system removed from the glide board. Place one foot at the base of the glide board with your toe pointed up to the sky. You may feel the stretch in your hamstring by simply holding this position with a slight lean forward. For a deeper stretch, continue moving forward (slowly) using the glide board to slide up into a maximum stretch that you can control. For the hip flexor stretch, just bend your front knee while keeping the rear leg straight. Allow your hips to lead the stretch by moving your hips forward. Allow the glide board to slide ahead and you can easily control the intensity of the stretch based on the distance you slide forward. That completes your set of stretches for golf! 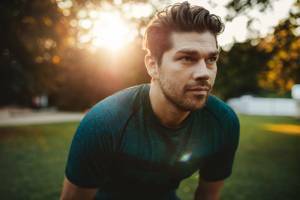 The benefits of having the Total Gym available to perform these stretches is that it provides added resistance and versatility through each movement that’s not available through conventional stretching. For golf, there are specific stretches on the Total Gym that will help you hit the ball longer, build a more consistent swing, and you will be able to play more golf without feeling fatigued!